Central and South America; Southern Texas to N. Argentina. 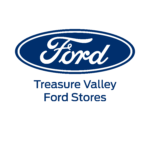 Variable within tropics and subtropics; from moist, heavily vegetated to dry scrub areas. 3 to 4 feet, including tail. 25-35 lbs. Females average 3/4 size of males. Maximum of 20 years in captivity. Mostly birds, fish, and small mammals. Snakes, monkeys, deer, and peccaries are sometimes taken. The fur is luxuriant and beautifully patterned. The upper parts have buffy ground color marked with dark rings and streaks. The rings have a brownish center. The under parts are white. The fur direction is reversed and grows forward in the pair of dark streaks prominent on each cheek. This is believed to be related to the forward motion of the tongue that is common in social grooming. Mating is not highly seasonal. Births have been reported from December through June. Gestation is 10 to 11 weeks. 1 or 2 offspring are born. Male and females share a territory, but the female cares for the young. 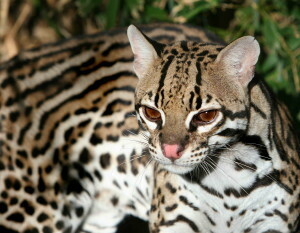 An adaptable cat, the ocelot climbs trees, swims well, and eats a variety of prey animals. They tend to grab and hold prey until it is dead, rather than “pounce, release, pounce” as many cats do. This strategy works well for slippery fish or birds that might fly away if given a chance. They pluck the birds thoroughly before eating. Ocelots squirt urine to mark their territories. Destruction of habitat, fur hunting, and hunting for the pet trade have negative impacts on ocelot numbers. They are easily tamed and are not difficult to trap. Ocelots are protected by the Lacey Act, which makes it illegal to transport, import, export, sell, receive, acquire, or purchase any wild animal that was taken in violation of the law. Ocelots do fairly well living in close proximity to humans as long as hunting pressure isn’t too intense and they have the appropriate habitats available to them. Habitat destruction is the primary threat to ocelots throughout some areas of their range. 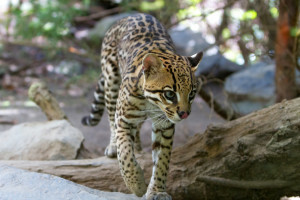 In the United States they are also protected by the Recovery Plan for the Listed Cats of Arizona and Texas, the primary objective of which is to maintain the ocelot populations in Texas. The plan includes provisions to further the study of ocelots in their wild habitat and an information and education program to get public support behind the effort to protect this species.